It is odd but often mastering radio communications is more intimidating to student pilots then learning the basics of airmanship. Student pilots have been dreaming of flight for years so they are excited to put their hands on the yoke and begin flight training. It is learning to master VFR communications that can often take some time and lead to trepidation in flying to unfamiliar airspace. I began my training at a Class D facility but moved to a small uncontrolled airport when my flight school closed just a month into training. This turned out to be a blessing in disguise. I found myself very comfortable with both environments. I heard from other students who were starting off at an uncontrolled airport about how nervous they would get prior to solo flights to Class D Airports. Most pilots will have a bias for airspace they are most comfortable and often that bias is more about the communication that the rules and formalities of the airspace. 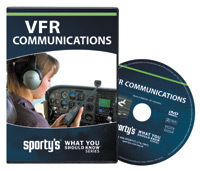 Sporty's VFR Communications DVD, part of the What You Should Know Series, attempts to address this subject. This is a recently updated DVD with new footage, content and visuals. It is hosted by frequent Sporty's host Rob Reider. The course takes just over an hour and covers the basics and tips of communicating to Air Traffic Control, non-towered fields and emergency situations. It includes scenario based training for departure and arrival at Class B, C and D airspace. It briefly touches on flight following and obtaining weather enroute as well. The course briefly covers "non-standard communications that you'll hear in the real world". I expected this to cover a variety of scenarios where communication breaks down or peculiar communications and situations. Unfortunately, it was a brief two minute segment that I wish they had expanded upon. Personally, I have found the most important aspect to becoming comfortable with VFR Communications is learning to anticipate radio calls. Anticipating how the tower, or ATC will respond to your radio calls help you to prepare for their response so you can respond swiftly and appropriately. Listening to Live ATC for a Class D airspace is another great learning tool. I often listen to the communications for Lunken Field, the Class D airport I started my training at. This is a great video for a student pilot who is looking to get comfortable with VFR Communications. Although, it was also a nice refresher and did provide some tips to help polish my communications, the content may be too basic for some pilots. For pilots participating in the FAA Wings Pilot Proficiency Program this course is accepted for training credits. I admit to sometimes being biased to the Sporty's videos. I learned to fly a short hop away from Sporty's in Cincinnati and love that the airports used in their videos are ones I am familiar with. Note of Disclosure: Sporty's provided me with this video to review. Great review, although i've never used the sportys dvd you mention. I can attest to the importance of getting radio communications down pat! Thanks for the recommendation! I've tried various methods in order to get my students proficient at making radio calls. Classroom exercises only get you so far, and things like nervousness, new environments, high traffic volume, high pilot workload can throw whatever classroom practice right out the window. I don't think there is a surefire way for every student to learn, but if this helps just a few with their flight training it's still worth it. I think most pilots really under estimate how important it is to have good radio communication skills from the very beginning and how important it is that CFI's stress the importantance of good radio communication skills. As I criss-cross the US every day, I hear even the most seasoned pilots use bad technique and/or the wrong phraseology which requires repeated transmissions which in turn takes up valuable time. It is always worth pointing out that there are tools out there to help even the most radio shy pilot become better in this respect.